Home Profile Directory Colleen Hackett Ph.D.
Colleen Hackett earned her Ph.D. in sociology at the University of Colorado (Boulder) and her B.A. in social sciences and international studies at Clark University (Worcester, MA). Professor Hackett established the Inside-Out Prison Exchange Program at CSU-Pueblo to better connect the academic community with the incarcerated community. She enjoys teaching and researching social inequalities, prison histories, and alternative justice models for dealing with harm and violence. Professor Hackett has published on the social control functions of therapy in prisons, the colonial roots of the modern penal system, prisoner resistance to confinement, and the gendered impacts of imprisonment and state-mandated rehabilitation. 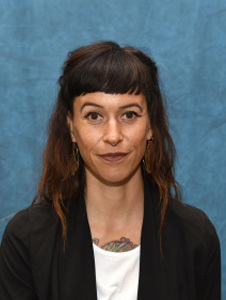 Her work has appeared in Feminist Criminology, Contemporary Justice Review, Journal of Prisoners on Prisons, Abolition: A Journal of Insurgent Politics, and Perspectives on Anarchist Theory. Hackett, Colleen. 2015. Justice through Defiance: Political Prisoner Support Work and Infrastructures of Resistance. Contemporary Justice Review. 18(1): 68-75.